Employing his extraordinary and unusual graphic style in works of acrylic and spray paint on canvas, wood or wall, Ruben Sanchez also creates digital illustrations, amination, and video, blaming the cultural worlds of graffiti and skateboard for his artistic lifetime commitment. Influenced by urban culture in his native Spain, he was attracted to the colors, shapes, and designs that covered the walls, as well as the fine art art pieces of Spanish masters like Salvador Dali, Pablo Picasso, and Joan Miró. He is a self-taught artist with a distinctive and recognizable graphic style that resonates through all of his projects. Sanchez was born in Madrid and from an early age was fascinated by street culture and all that it brings. The artist claims that he was ‘kidnapped’ when he was 14 years old by skateboarding and graffiti which is the metaphor for how street shaped him and his artistic development. Seriously influenced by the skate parks and graffiti scene in Madrid, he started to skip school lessons just to spend some time with the skaters and artists there, totally enraptured by that kind of lifestyle blossoming in the hidden areas of the city. At the age of 16, to the displeasure of his parents, he completely left the school deciding to follow his passion. Soon, he found himself trying his hand at graffiti. “As a kid, graffiti started more like a game. It was about who was spreading his name more, who was doing it higher, bigger, in harder places, all around the city. But with time, you start caring more about style, colors, possibilities, and creativity.” Never officially studied art in school, he started learning bit by bit about techniques and styles. Combining the elements of graphic design, tribal art, graffiti, Cubism, skateboard culture, 90’s and 80’s music, flamenco, social situations, Mediterranean life, Surrealism, nature, and kaleidoscope among others, Sanchez creates geometric graffiti murals that explode with powerful colors and surrealistic magic. At the age of 21, the artist moved to Barcelona, the very heart of street art and skating in Europe in the 90s. In Barcelona, he had to juggle his passion with working as a graphic designer (which he learned from studying on the internet) to pay the bills. Even though Sanchez’s work can be found internationally – his native Spain can be found in his artwork anywhere it’s painted. In 2003 Sanchez participated in a creation of Alai skateboards, a Spanish skateboards and clothing company based in Bilbao, where he acted as the art director also. 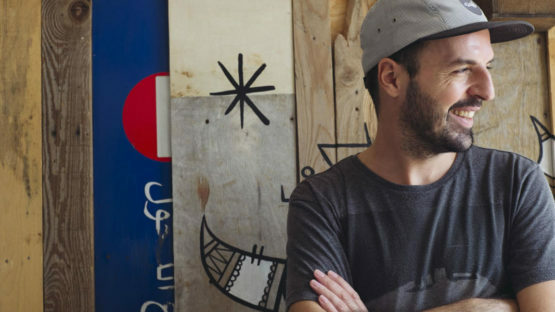 His works can be seen on walls and in gallery spaces worldwide, as well as numerous collaborations with different brands and collectives mostly related to skateboarding. 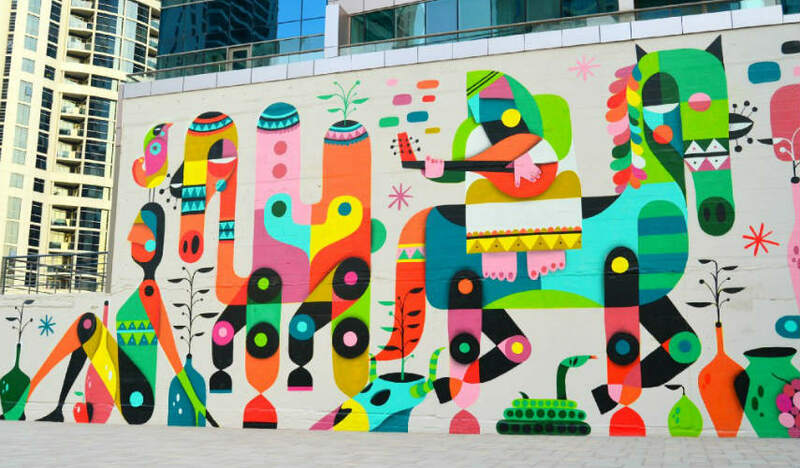 In 2015, he had an opportunity to legally paint mural in Dubai where under different circumstances one can go to jail for painting on the street walls. Thanks to a one-year residency program in Tashkeel, an art organization based in Dubai with the aim of helping creative practice and cross-cultural dialogue. During the same year, the artist participated in a group exhibition entitled It’s Summer Time! in the streets of East London that presented brand new and never seen pieces from some of the greatest names of the street art. 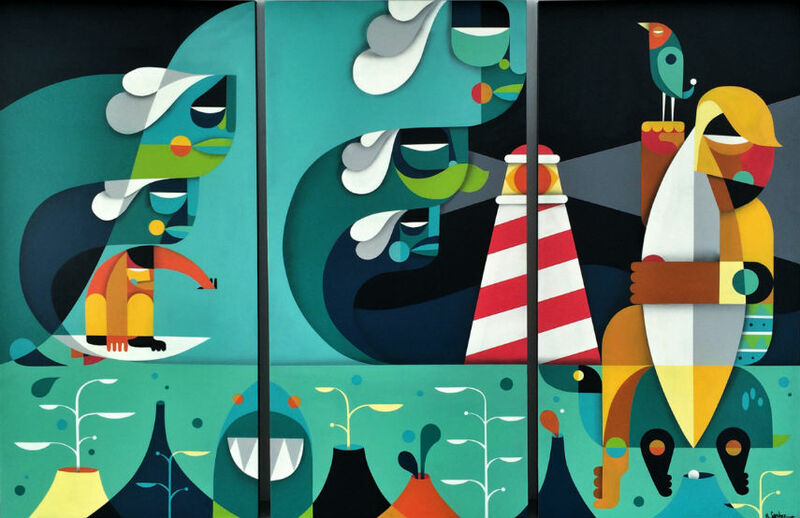 Being a part of numerous group shows and projects, Sanchez believes in idea that streets and its elements belong to the people, striving to revives old spaces and gives life to boring things through vivid colors and images. Ruben Sanchez currently lives and works in Dubai.